1) Climatic changes, draughts, rampant and uncontrolled industrialization has led to alarming levels of waste being disposed into our water sources such as rivers, water reservoirs and ground well water. 2) Ageing pipeline network and poor maintenance results in water getting contaminated by the time it reaches our homes. Since the demand for municipal water is greater than the supply and due to the onset of multi-storied buildings and condominiums, the practice of storing water in overhead tanks has become more common. These storage tanks are not airtight and are also not cleaned thus they become breeding grounds for unwarranted harmful microorganisms like bacteria and viruses. With increased reliance on pesticides and insecticides in our agricultural industry in Malaysia, these harmful chemicals, when used excessively, percolate into the ground well water as well as get washed away into the rivers. Rivers are no longer sufficient to meet society’s ever-increasing demand of drinking water and hence there is an increased reliance on ground well water, which contains excessive levels of dissolved impurities. Recent news in Malaysia on using Mining Areas to store water just makes things worst. Further, RO technology uses a very fine membrane which has a pore size of 0.0001 micron. The process requires raw water to be forced at a very high pressure so that water passes through the small pores of the membrane, which blocks the bacteria, germs and other impurities from passing through. However due to variation in day and night temperatures and high speed pressure, some of the pores of the membrane get enlarged after few months of continuous use, allowing harmful micro-organisms to easily pass through it, thereby making the process ineffective in the long run. Keeping in mind the disadvantages of RO technology, KENT has invented a new technology called the KENT's Mineral RO™ Technology. This patented technology has all the benefits of the RO technology, while eliminating its limitations. KENT’s patented KENT's Mineral ROTM Technology uses an innovative TDS (total dissolved solids) control valve which allows the user to control the amount of essential natural minerals present in drinking water. It ensures that the RO purified water does not have a bitter taste and the pH is maintained around 7. It also enables the user to adjust the amount of TDS in purified water according to one’s taste. This technology is based on double purification wherein water after passing through RO, is also passed through Ultra Violet (UV) Light and Ultra Filtration (UF). 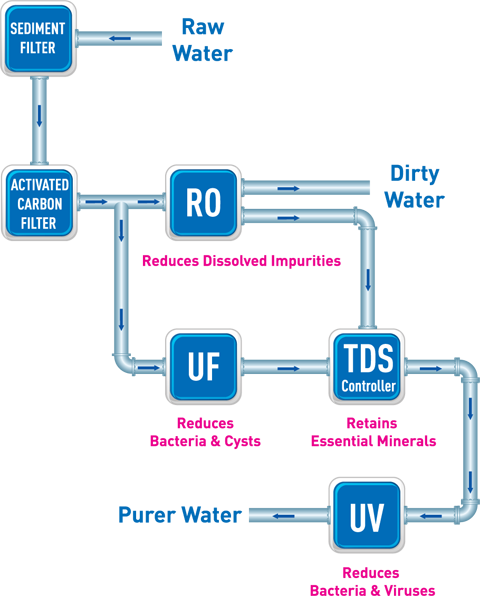 Secondary purification by UV/UF ensures that when the pores of RO membrane open up and allow harmful micro-organisms to pass through, they get deactivated / filtered out by UV/UF.